"Everybody is looking for KRSNA. KRSNA is GOD, the Source of all that exists, the Cause of all that is, was, or ever will be. Allah-Buddha-Jehova-Rama: All are KRSNA, all are ONE. God is not abstract; He has both the impersonal and the personal aspects to His personality which is SUPREME, ETERNAL, BLISSFUL, and full of KNOWLEDGE. As a single drop of water has the same qualities as an ocean of water, so has our consciousness the qualities of GOD'S consciousness... but through our identification and attachment with material energy (physical body, sense pleasures, material possessions, ego, etc.) our true TRANSCENDENTAL CONSCIOUSNESS has been polluted, and like a dirty mirror it is unable to reflect a pure image. If there's a God, I want to see Him. It's pointless to believe in something without proof, and Krsna Consciousness and meditation are methods where you can actually obtain GOD perception. You can actually see God, and Hear Him, play with Him. It might sound crazy, but He is actually there, actually with you. 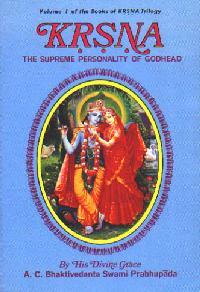 I request that you take advantage of this book KRSNA, and enter into its understanding. I also request that you make an appointment to meet your God now, through the self liberating process of YOGA (UNION) and GIVE PEACE A CHANCE."